Make sure that you come hungry to Sunday's Appetite for Awareness event at the Philadelphia Cruise Terminal. In addition to the dozens of area restaurants and local and national vendors sampling food, there will be cooking demonstrations from Le Bec Fin's Georges Perrier, 10 Arts' Monica Glass and cookbook author Silvana Nardone. Tickets will be available at the door, but you can save money by ordering online today or tomorrow. Even if you can't make it, you can follow the action in real time on Twitter using hashtag #A4A10. I've posted to the restaurant list updated gluten-free menus from two Jose Garces restaurants, Chifa and Amada. His new place at Philadelphia's Cira Centre, JG Domestic (2929 Arch Street, 215-222-2363), doesn't yet have a similar menu, although requests can be accommodated. Good Eatz Green Cafe in West Reading (701 Penn Avenue, 610-670-4885), the sister business of Rick Allebach's Good Eatz Bakery, offers plenty of gluten-free options for breakfast, lunch, dinner and Sunday brunch. If you're flying in or out of Terminal E at Philadelphia International Airport, you can grab a quick bite off the gluten-free menu at Cantina Laredo in Terminal E (215-492-1160). Connie at The Pop Shop in Collingswood let me know that the restaurant now uses bread from Miller's Gluten Free for its grilled cheese and other sandwiches. We stopped in last Saturday night, and our older son gives it a thumbs-up. The bread is now sliced thicker so that there's one large sandwich rather than two smaller ones. Philadelphia's all-gluten-free Sweet Freedom Bakery is now taking orders for Thanksgiving goodies, including pumpkin and apple pies and pumpkin chocolate chip cupcakes. Order before November 18 by calling 215-545-1899. The Mag Bar, located at Maggio's in Southampton (400 Second Street Pike, 215-322-7272), serves New Grist beer and two varieties of Woodchuck ciders. Acme Markets is offering customers with gluten sensitivity a tool to help them shop for gluten-free foods. The new program will begin in this month and roll out in phases during the next three months. As part of the program, select stores will have signage and special merchandising sets to help make it easier for customers to find gluten-free products. Shoppers can also stop at the customer service desk at any Acme to pick up an in-store shopping list/guide to gluten-free products. More extensive gluten-free shopping lists as well as recipes and snack and meal solutions are available at Acme's gluten-free website page. Allergen-friendly Ian's Natural Foods keeps the new products coming, and this one looks particularly promising. 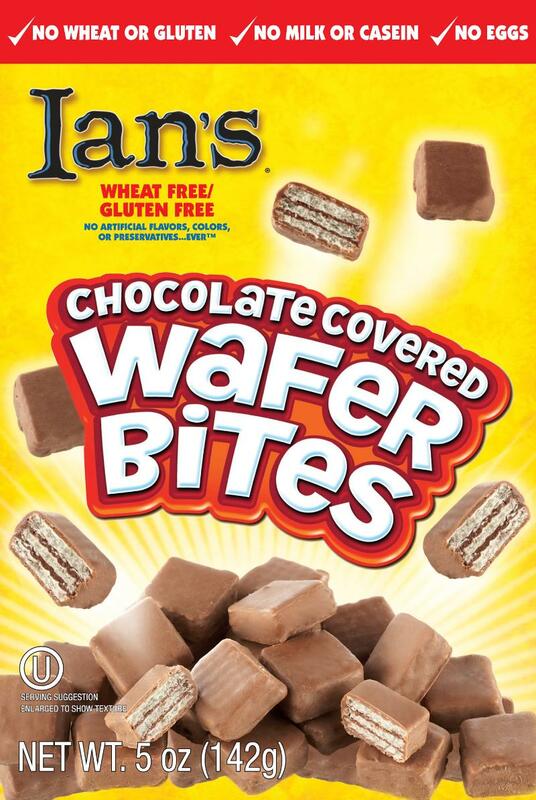 Now available are gluten-free chocolate-covered wafer bites, similar to Kit Kat candy bars. The treats are available at glutenfree.com ($4.99 a bag) and will soon be in stores. Shabtai Gourmet Gluten Free Bakery has just won the Kosherfest Best New Passover Product Competition for the fourth time. The winning product this year is Yidels Mini Swiss Chocolate Rolls, which will be available in time for Passover next Spring. The bakery will be participating in A4A. The gluten-free muffins and cakes from Butterfly Bakery, which until recently were available at Wegmans, have been discontinued. Tomorrow at Big Blue Marble Bookstore in Mt. Airy (551 Carpenter Lane, 215-844-1870), author Jae Steele will read from her new cookbook, Ripe From Around Here . The book, which emphasizes the importance of local, sustainable eating, has many gluten-free recipes for meals like Polenta Spice Pudding, Love Muffins and Springtime Tabouleh. The event begins at 3 p.m. The next Chester County Gluten Intolerance Group meeting is scheduled for Monday, November 1 at Paoli Hospital, with guests Keith J. Laskin, M.D. (medical director of the hospital's Celiac Center) and dietitian Nancy Patin Falini (author of Gluten-Free Friends: An Activity Book for Kids ) set to speak. The event will be at the hospital's Potter Room (Zone B, Level 1) beginning at 6:30 p.m. Register by calling 1-866-CALL-MLH. I hope everyone has a great weekend, particularly if you're attending A4A! It's too bad about the gluten-free muffins and cakes from Butterfly Bakery - we really liked them. Unfortunately Wegman's did a lousy job of displaying them - they were in the "regular frozen muffins" section instead of the GF section so we had to really hunt for them. Any info on why they were discontinued so quickly?